Adrianna Wagley was born to Pete and Tillie Moret on March 29, 1917 in Chandler, MN. She grew up there attending country school and Chandler High School. She was baptized at Chandler Reformed Church. On September 18, 1938 Adrianna married Gordon Wagley in Lake Wilson, MN. They farmed in the Reading MN area. In 1963 they moved to Luverne, MN, where she did housekeeping for local families. Adrianna enjoyed scrapbooking, genealogy and fishing. 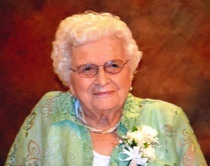 She was active in her church and was a member of the Ladies VFW Auxiliary. In 1985 Adrianna and Gordon took a trip to the Netherlands to visit relatives. On October 7, 2008 Adrianna entered the Parkview Manor in Ellsworth, MN. On June 10th, 2017 Adrianna celebrated her 100th birthday at Grace Lutheran Church. It was a celebration she truly enjoyed with family and friends. Adrianna passed away on Friday, Feb. 23, 2018 at Parkview Manor. She is survived by three sons, Peter (Nancy) of Salinas, CA, Gary (Phyllis) of Rushmore, MN and Michael of Luverne, MN; eight grandchildren: Michelle, Leslie, Michelle, Michael, Kurt, Jeffrey, Angela and Stacey; six great grandchildren and six great-great grandchildren; one brother-in-law, Roger; and one sister-in-law, Vangy and many nieces and nephews. Adrianna was preceded in death by her parents, husband, Gordon on January 10, 2002, one grandson, Bradley; one brother John; two step brothers, four step sisters, two brothers-in-law, and three sisters-in-law. Adrianna Peternella Wagley, 100, of Ellsworth, MN died Friday, February 23, 2018 at Parkview Manor in Ellsworth. Visitation will be held on Tuesday, Feb. 27 from 5:00 - 7:00 PM at Grace Lutheran Church in Luverne and will continue from 9:30 to 10:30 AM at the church prior to the Memorial Service on Wednesday, Feb. 28, 2018 at 10:30 AM. Rev. Stephen Hilding is officiating. Organist is Beryl Haugen; Soloist - Heidi Sehr accompanied by Janine Papik. Pallbearers are: Jerry Wagley, Dean Groen, Ron Harms, Nancy Sauder, Mark Kurtz and Jon Weitgenant. Interment is at Maplewood Cemetery in Luverne, MN.